Caught at the Curb: You Must Be Ly'in....The Rest Of The Story! 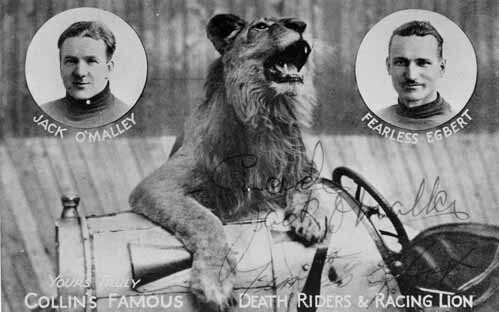 Awhile back, I posted a picture of a lion riding in a car around a large drum-shaped "wall of death". I never knew the context of the picture, but now I do. Thanks again to CATC friend, Jesse, at "Just A car Guy", for filling me in on that picture of that daredevil lion. It turns out that lion belonged to "Fearless Egbert" and was a seasoned performer at various state and county fairs back in the 1930's. Go to Jesse's blog entries for more pictures and information about this unique act. Labels: humor, Just A Car Guy, WTF?